When the Mercedes-Benz GL was introduced in 2007, the first generation of the full size sport utility won the prestigious Motor Trend award, an achievement the second generation 2013 GL has repeated as the magazine’s SUV of the Year for 2013. The second generation 2013 GL model lineup offers a choice of four engines depending on power needs that range from 240 to 550 horsepower. On the economical side of luxury, the buyer can choose from the fuel-sipping GL350 BlueTEC turbodiesel providing 240 hp and 455 lb.-ft. of torque or the 362 hp GL450 with 406 lb.-ft. of raw power. If performance is required, then Mercedes-Benz provides the 429 hp GL550 with 516 lb.-ft. or torque or the high-performance GL63 AMG with 550 draft horses with 560 lb.-ft. of pulling power. Both utilize new direct-injection biturbo V8 engines. 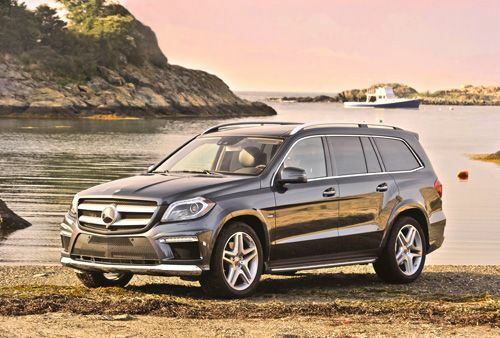 The full-size 2013 Mercedes-Benz GL is just one of four sport utilities in the Mercedes-Benz line, including the mid-size M-Class, the compact GLK and the highly respected G-Class. "We're honored that the GL-Class has once again been awarded Motor Trend's Sport/Utility of the Year,” said Steve Cannon, President and CEO of Mercedes-Benz USA. “From the very beginning, the GL-Class has been perfectly tuned to the needs of U.S. customers and those customers made the GL the segment-leading sales performer. Motor Trend's critical acclaim for the depth of its functionality together with the broadest powertrain offering in any full size SUV shows our commitment to delivering on our promise to our customers of the best or nothing." Motor Trend has been analyzing and evaluating vehicles for its Sport/Utility of the Year Award since 1999. Eligible vehicles must be all new or significantly redesigned with a retail debut in the past 12 months. The magazine’s editorial staff puts 11 selected SUVs through standardized testing, to determine a rating for virtually every aspect of the vehicle. The process used to arrive at each year’s winner involves six criteria – advancement in design, engineering excellence, efficiency, safety, value and functional performance. A week is spent reviewing each vehicle, before Motor Trend selects the model best meeting their criteria. Tests trials include 0 to 60 mph and 1/4-mile acceleration testing, 60 to 0 mph brake testing, figure eight handling and skid pad testing. After eliminating a few of the vehicles, 35-mile road loops on urban, freeway and canyon roads are conducted, followed by five miles of light offroad exercises. The GL scored especially well in offroad handling, also gaining points for the premium interior and breadth of the line. The new full-size GL introduces a new safety system called COLLISION PREVENTION ASSIST, which uses radar sensors to detect stationary objects in front of the vehicle. When a risk of imminent collision arises, it pre-charges the brakes and alerts the driver with both audio and visual alerts. Other new safety systems include ATTENTION ASSIST, ADAPTIVE BRAKE technology, mbrace2 telematics and Crosswind Stabilization. Optional systems include an ACTIVE CURVE SYSTEM, On/Off-Road Package, Active Parking Assist, Active Lane Keeping Assist, a 360-degree Surround View camera, Panorama Roof and power EASY-ENTRY for third-row passengers. The 2013 GL-Class comes with electrically assisted rack-and-pinion steering, providing built-in speed-dependent power assist, along with fuel savings. With no hydraulic power steering pump, the new steering uses only electrical power to be turned. The new steering assist enables optional Active Parking Assist, to make parallel parking stress-free. When reverse and Active Parking Assist is engaged, the system initiates automatic steering as the driver controls acceleration and braking at speeds below seven mph. When it’s time to leave, Active Parking Assist also includes an automatic exit feature. Is it time to rest? The GL-Class features the latest ATTENTION ASSIST system to alert the driver to drowsiness, a factor causing more than 100,000 accidents a year in the US. A steering sensor is coupled to smart software that uses 70 parameters to establish a unique driver profile during the first 20 minutes of driving. When speeds between 50 and 112 mph are reached, the system reacts to the erratic steering corrections drivers make as they get drowsy and triggers an audible warning. It also displays, “Time for a Rest?” with the suggestion of a cup of coffee via an icon that appears in the instrument cluster. The 2013 GL-Class line has an enhanced seven-speed automatic transmission providing better fuel economy plus more responsive driving, quieter operation and increased durability. The new transmission uses an advanced torque converter lock-up clutch, designed to work best with a new type of low-viscosity ATF transmission fluid, colored blue instead of the usual red. Along with low-drag planetary gears, bearings and internal seals, the “FE-ATF” fluid provides less friction and improved fuel mileage. Lower hydraulic pressure and enhanced electronic software helps provide even smoother shifting. The official announcement of the 2013 Mercedes-Benz GL receipt of the Motor Trend 2013 Sport/Utility of the Year will come in the December edition of the magazine. available at newsstands soon.